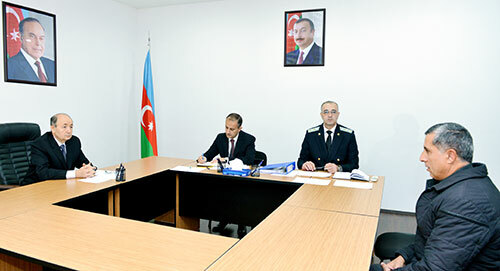 In accordance with the President Ilham Aliyev s assignments related to decent service to the people, care and sensitive approach to citizens appeals, meantime full ensuring of the principle of justice by state bodies, the Ministry of Justice keeps constant attention in reception of the citizens in the regions. In accordance with the schedule of the heads of central executive bodies on citizens reception in the cities and regions, the Minister of Justice, Chairman of Judicial-Legal Council Fikrat Mammadov received citizens living in Aghsu and surrounding districts in Aghsu region, on October 28. Before the reception the Minister and the head of Executive Power of Aghsu region Anvar Seyidaliyev visited the monument to national leader Heydar Aliyev, laid a bunch of flowers and expressed deep respect for the memory of the great leader. During the reception, every citizen was carefully listened, some of the issues raised in the appeals were resolved on the spot, the relevant instructions was given to the responsible officials of the ministry who attended in the reception on other appeals. Expressing their satisfaction for the creation of convenient and favorable conditions for local residents to receipt and review applications on the spot, citizens expressed their gratitude to the President Ilham Aliyev for his care and attention. During the visit, the Minister of Justice, Chairman of Judicial-Legal Council has acquainted with the activity and working conditions of local judicial and justice bodies and held meeting with judges and justice employees. The requirements of the head of state relating to the establishment of civil-servant relationship on a healthy basis, the strict adherence of ethics conduct rules and improvement of people s satisfaction were pointed out and relevant recommendations and instructions were given on the proper organization of citizens reception and reviewing the cases, at the meeting. At the same time, the importance of transparency, ensuring the fairness of judicial judgments, as well as avoidance of biased approach were noted and was spoken on the important institutional and legislative measures in the field of struggle against corruption.